V2169. HUGUES CUENOD, w.Geoffrey Parsons (Pf. ): Songs by Menasce, Chabrier, Honegger, Satie, Roussel & Poulenc. (England) Nimbus NIM 5027, recorded 1985. Slipcase Edition, w.Elaborate 40pp. Brochure, w.texts. Long out-of-print, final copy! “Having made his début in his mid-twenties, Hugues Cuénod continued to perform into his nineties, making his début at the Met only in 1987 (when he was 85) with a firmly and expressively-sung Emperor Altoum, in TURANDOT. His début at the Wigmore Hall the next year was no less impressive. A student of Nadia Boulanger in Paris in the 1930s, Cuénod participated in the pioneering recordings she made of the Monteverdi madrigals, and also made outstanding recordings of lute songs, of Couperin and of the Evangelist in Bach’s ST MATTHEW PASSION. But Cuénod was mainly known as one of the most expressive interpreters of French mélodie, a genre to which his silvery, youthful-sounding tenor was ideally suited. He had the unusual ability to ‘speak’ sung words like an actor with perfect diction and clarity, a facility enhanced by his delicate, dry timbre. His style was simple and natural and he never allowed himself to descend into the sort of sentimentality to which many singers of mélodie succumb. Cuénod did not confine himself to the early and French repertoire. His career was so long-lasting and he was so good a sight-reader that he sang almost everything, from Machaut to Stravinsky, and was almost equally fluent in English, German and Italian as he was in his native French. Despite its light, ethereal quality, his voice could be heard even in the most demanding venues. On the operatic stage his finest roles included Don Basilio in NOZZE, the Astrologer in Rimsky-Korsakov’s LE COQ D’OR, and Sellem in Stravinsky’s RAKE’S PROGRESS — a role created for him. In Britain, he became a mainstay at Glyndebourne, taking part in more than 470 performances between 1954 and 1987. His roles included Don Basilio and the travesty parts of Erice and Linfea in Cavalli’s L’ORMINDO and LA CALLISTO. He bowed out in 1987 in the cameo role of the Prompter in Strauss’ CAPRICCIO. Hugues-Adhémar Cuénod was born on 16 June, 1902 at Corseaux-sur-Vevey, Switzerland, and received his vocal training at the Ribaupierre Institute in Lausanne, then at the conservatoires in Geneva, Basel and Vienna. He began his career as a concert recitalist. In 1928 he made his opera début in Ernst Krenek’s Weimar era work, JONNY SPIELT AUF, at the Théatre des Champs Elysées in Paris, a year after its first performance in Leipzig. The following year he was plucked from obscurity by Noël Coward and given a small role as one of the Green Carnations in the first production of BITTER SWEET, which opened at His Majesty’s Theatre in London before moving to Broadway. During the 1930s Cuénod continued to spend most of his time on the concert platform in Geneva, Vienna and Paris, where he frequented aristocratic salons and worked with Nadia Boulanger on her pioneering Monteverdi recordings. Towards the end of the decade he made an extensive concert tour of America. During the war years he taught at the Geneva Conservatoire and in 1943 resumed his operatic career, singing in DIE FLEDERMAUS. After the war he joined the international opera circuit, making his début at La Scala in 1951, and at Glyndebourne and Covent Garden in 1954 (as the Astrologer in LE COQ D’OR). His pioneering 1950 recording of Couperin’s ‘Lamentations’ prompted Stravinsky to ask him to sing in the premiere of THE RAKE’S PROGRESS in Venice in 1951. He was also closely associated with Stravinsky’s ‘Cantata’. 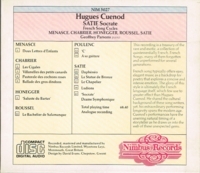 In the 1970s he signed a contract with the small Welsh-based record label Nimbus and made several recordings, of which Satie’s SOCRATE won the Grand Prix du Disque Mondiale at the Montreux Music Festival. Miraculously, Cuénod’s voice remained preserved virtually intact almost into his nineties and he never lost his interpretative skills or his empathy with words and music. In later life he ran joint courses at the Britten-Pears School at Snape with the Belgian soprano, Suzanne Danco. These were not only delightful events but also object lessons in the teaching of the impeccable style of which they had both been such effective advocates. Cuénod’s last public appearance was at a gala to mark his 100th birthday in 2002, at which he was presented with the World of Song Award by the Lotte Lehmann Foundation. A guest at the reception afterwards recalled that Cuénod, who showed no signs of letting up, buttonholed him as he was preparing to leave: ‘Please stay tomorrow and come to my house: we’ll do music’, he said. In 1976 Cuénod was appointed Chevalier des Arts et des Lettres by the French minister of culture.